Hospices or almshouses (in Dutch: Godshuizen) are charitable housing that were usually built for needy or elderly people. The initiative often came from crafts organisations but or rich individuals ordered their establishment. 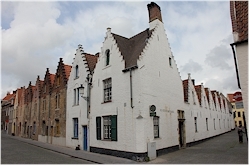 In Bruges these houses already start to appear in the 14th century. Generally they consist of groups of small, soberly furnished houses that are gathered around an inner courtyard. The houses are usually not more than one storey high. Luckily, in Bruges some 40 of those complexes survive till today. Most of them are still serve a social purpose (as housing for elderly, poor, disabled people,...). - Hospice Van Volden. 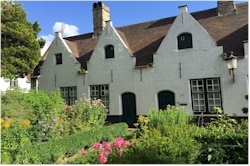 Established as hospice by the brothers Van Volden in 1614 for first eight and later twelve elderly men. Previously a mental asylum. Nowadays a service center for senior citizens. Location: Boeveriestraat 50. - Hospice De Moor. Established in 1480 by D. De Moor and his wife. Location: Boeveriestraat 52-62. - Hospice Van Peenen. Established in 1621 by P. Van Peenen. Location: Boeveriestraat 9-19. - Hospice O.L.V. Van De Zeven Weeën. Estalished in 1654 by M. de Damhouder and J. van der Straeten. Seven housings for widows. Location: corner Oude Gentweg and Driekroezenstraat. - Hospice Sint-Trudo. 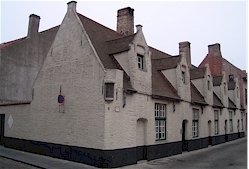 Initially shelterhouse (refuse) of the abbey St.-Baafs of Ghent, bought by the abbey of St.-Trudo in the 16th century then redesigned as hospice in 1808. Location: Garenmarkt 23-25. - Hospice Vander Meulen. Founded in 1676 for widows of weavers. Location: Greinschuurstraat 13-17. - Hospice De Pelikaan. Founded in 1714, destinated for seven widows. Location: Groenerei 8. - Hospice Reyphins. The hospice was initially founded in the 17th century, but was relocated in 1905. Location: H. Consciencelaan 2-11. - Hospice Marius Voet. Established in the 17th century by M. Voet. Location: Kammakersstraat 13-17. - Hospice Blindekens. Location: Kammakersstraat 19-25. - Hospice Van Paemel. Founded in the 17th century by J. Van Paemel. Location: Kammakersstraat 7-11. - Hospice De Generaliteit. Till 1873 part of hospice Hertsberghe. Location: Katelijnestraat 79-85. - Hospice Hertsberghe. Founded in 1683. Location: Katelijnestraat 87-101. - Hospice Spanoghe. Established by F. Spanoghe in 1680 as hospice for women. Location: Katelijnestraat 8. - Hospice Rooms Convent. Founded as a convent in 1330 and converted into hospice in the course of the 15th century. It was to host 7 to 8 poor women. Location: Katelijnestraat 9 and 19. - Hospice Reylof-De Blieck. Was founded in 1456 by J. De Blieck as a hospice of widows. Lateron, in 1631 the hospice was enlarged by O. Reylof for the shelter of poor people. Location: Korte Vuldersstraat 1. - Hospice of the bakers. Founded in 1469 as a hospice for needy and elderly bakers. Location: corner Zwarteleertouwersstraat and Kruitenbergstraat. - Hospice Cobrysse. 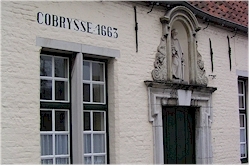 Established in 1663 by P. Cobrysse and his wife for the shelter of poor women. Location: Leffingestraat 5-11. - Hospice Soutieu. The hospice was relocated to its current place in 1910. It was originally founded in 1661. Location: Maagdendal 16. - Hospice Vette Vischpoort. This hospice was founded in 1434 but moved to its current location in the beginning of the 16th century. Location: Moerstraat 10, 16. - Hospice Goderickx. Initially founded for the shelter of poor widows in 1383. Relocated to its present spot at the end of the 16th century. Location: corner Moerstraat and Geerwijnstraat. - Hospice Sint-Jozef. Moved from another location in 1905. Founded at the end of the 17th century. Location: corner Nieuwe Gentweg and Driekroezenstraat. - Hospice De Meulenaere. Established in 1613 by J. De Meulenaere for poor widows. Location: Nieuwe Gentweg 8-22. - Hospice of the masons. Established in 1757 in already existing houses for masons. Location: Noord-Gistelhof 3-9. - Hospice De Vos. Established in 1715 by C. De Vos, consisting of initially six housing units. Location: Noordstraat 6. - Hospice of the tailors. Built in 1756 as housing for eight tailor families. Location: Oude Gentweg 126-130. - Hospice for poor women. Location: Peperstraat 3a. - Hospice Heilig Nest. Older houses only used as hospice since the beginning of the 20th century. Location: Pottenmakersstraat 19. - Hospice De Croeser-De Ruysscher. Neogothic complex established in 1919. Location: Raamstraat 29-57. - Hospice O.L.V. Bijstand. According to the inscription dating back to 1711. Location: Rozendal 20-22. - Hospice of the smiths. Location: Smedenstraat 54-56. - Hospice Le Maire. Established in 1910 in an old warehouse. Location: Walplein 31. - Hospice O.L.V. Boodschap. Founded in 1711. Location: Zakske 26-32. - Hospice De La Fontaine: Founded in 1636 by count de la Fontaine and his wife. It had twelve housing units intended for soldiers that were no longer able to perform their military duty. Location: Zwarteleertouwersstraat 82.